The Mercedes S-Class is one of the most beautiful and comfortable limousines. This flagship of the German brand is the top of the range sedans and will satisfy the most demanding customers. 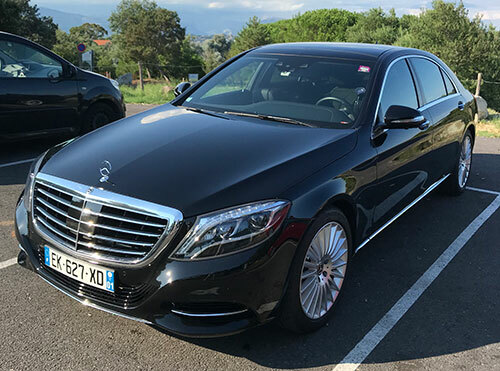 If you are traveling on the French Riviera, in Cannes or Nice, you will certainly want to move in this luxurious sedan with driver. 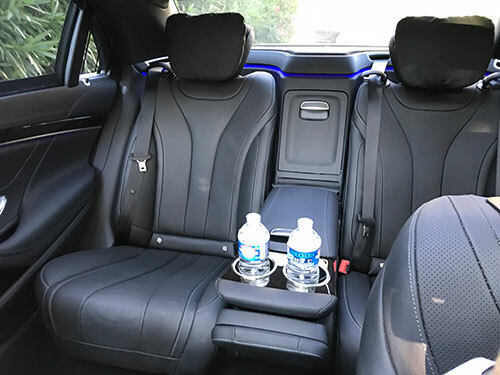 AzurVTC offers you the ultimate cars, with a courteous and experienced driver, for all your travels during your stay in Provence Alpes Côte d’Azur. We offer transfers from Nice airport or from your hotel to all Europe (Cannes, Paris, Monaco, Milan, Geneva …). We also offer chauffeur-driven car rentals by the hour or by the day. We have a Mercedes S-Class 350 L black from 2018. This high-end sedan welcomes from 1 to 3 passengers. It can store up to 3 bags and has Wi-Fi on board. The passenger space of this limousine is simply grandiose and comfortable. The rear right seat has enough space, lowering the front seat, to lie down and sleep. The car can also be transformed into a real mobile office thanks to the Wi-Fi on board and its convertible space. We put at your disposal on board the press, refreshments and confectioneries. At the forefront of technology, the flagship of the German brand has an anti roll system offering maximum comfort on the road. The Mercedes S class is currently the best Mercedes available and will satisfy the requirements of the world elite. It’s simply the best car with chauffeur you’ll find in France. AzurVTC is the company of a VTC chauffeur based in Cannes. Our chauffeur has a license and is registered with the prefecture of Provence Alpes Côte d’Azur. With a long experience of excellence serving important personalities, your chauffeur will satisfy all your requirements. Polite, courteous, punctual and discreet, we offer you a very high quality service. We offer a S-Class service with chauffeur for transfers, trips or provision. Our price list from Cannes is available on our website, you can consult it by clicking here. Do not hesitate to ask for a quotation for your displacements by contacting us on the contact page of the site or simply by calling us by telephone at 06 48 28 98 15. See you soon in your Mercedes S-Class with chauffeur in Cannes for a luxurious transport in the best conditions.